You buy a brand new utility pole (or many), plan the job and install the poles. These field assets have an estimated life that you can generally count on before they will need to be replaced. On this day, you know that the data about those poles and the poles themselves are mirror images; reality matches your information. This will be the only day you know that for sure—unless you continuously manage and update your asset data. Field asset management is not a straight line from pole installation to decommission. Rather, it is a cycle—a never-ending loop of cause and effect, action and reaction, that every utility pole owner is traveling around at this very moment. To figure out where you are on the wheel of field asset management – and what to do about it – you need only to identify with one of the following four statements. I need better data. If you are here, you are asking, "What is the reality of my plant in the wild? Is it safe? What other parties have equipment attached? What do I have attached?" At some point every pole owner will ask these questions simply because the asset lifecycle is past day one. I need to collect data. 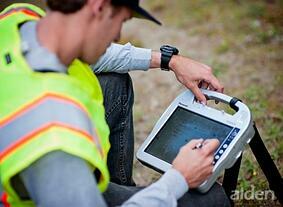 The first step to answering the questions above is to collect data on your field assets. This effort can often lead to more questions: "Do I have the right people on staff to collect this data? Should I do a broad inventory or targeted inspection? Do I have the tools to get the job done correctly?" When those have been answered and data has been obtained, many pole owners – and even asset data management providers – expect the job to be over. However, the cycle is continuous. Data means very little if you can't take action based on it. I need results from my data. At this stage in the field asset management cycle, the data has been delivered. Now you must drive results from that data. Whether your goal is to resolve contract issues or field violations, more efficiently manage third-party attachers, or plan for upcoming repairs, this stop along the cycle may feel like an end point, but the cycle goes on. I need to keep my data current. So now you've captured great data, which has helped you fix longstanding issues, communicate with partners and plan for the future. Your job now is to never be back in the starting position again. New data is, as it was when you first installed your poles, only current and useful for a short amount of time until something changes in the field. Keeping your asset data records current is a matter of process, making contact easy for potential attachers and creating timelines for rotating field audits. These strategies keep solid data fresh as long as possible and minimize violations by others. At that point you will "collect data," by asking a mechanic in the field to tell you what is wrong. Results arrive as the mechanic takes action on the data he has found—fixing the problem. Down the road, routine maintenance (i.e. oil changes, checkups at specific mileages) will keep you running happily for longer… that is, until you need to buy another car. The thing is, just like with utility assets, you know a person that has never taken their car in for an oil change. You know a driver who thinks everything is perfect—until the wheels fall off. Our advice: don't let this happen to your joint use assets. Discover where you are on the cycle, ask the right questions, get great data, use it, and keep it up to date. Use the help of an experienced, full-service infrastructure asset management partner and start today.